The glamorous couple has been dating for 3 years and got engaged with a flash mob at a Chipotle fast food restaurant last year. 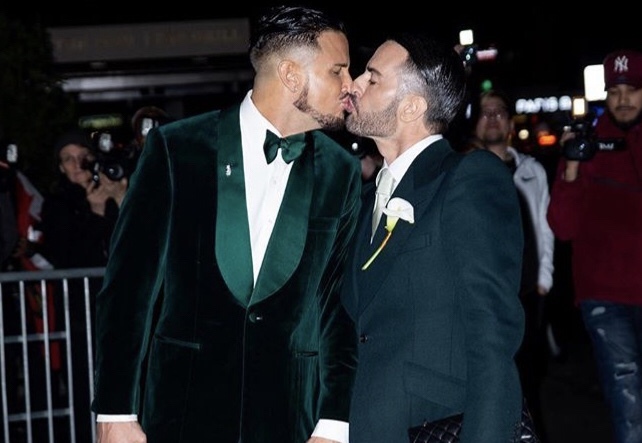 Marc and Char held their wedding reception at a New York City restaurant and among the guests were celebrities and fashion superstars like Kate Moss, Naomi Campbell and Gigi and Bella Hadid. Even though the event was kept private from most traditional media, it was well documented on social media by both the couple and their guests. Marc posted an image of an onyx diamond penguin pin, which both he and Char wore. He also posted an image of some awesome lion head cufflinks by New York-based jeweller David Webb. Marc Jacobs was born April 9, 1963 in New York City, U.S.A., where he still resides. Jacobs is a prominent fashion designer with his own fashion label, “Marc Jacobs”. From 1997 – 2014, Jacobs was the creative director of French design house, Louis Vuitton. Jacobs has won the award for “Womenswear Designer of the Year” from the Council of Fashion Designers of America five times. He was awarded a lifetime achievement award from the same council in 2016. At one point, Jacob’s had 285 retail stores open throughout 60 countries. Marc Jacobs has been out as gay for as long as he’s been in the public eye. On April 4, 2018, Jacobs proposed to model Charley Defrancesco with a flashmob in a Chipotle restaurant. They married a year later on April 6, 2019.